I have tried all the other modular synthesizers on iOS. None ever really impressed me very much until now. Even though its not the first modular synth to hit iOS, it does perform well, and I like its U.I. in favor of the others. Audulus arrives and changes my whole perception of this kind of music application. I’ve known about the enthusiastic following of the Mac version, so like many of you I was pretty psyched about it porting over to iPad. I had been looking forward to finally give it a try. I wasnt sure what to expect? 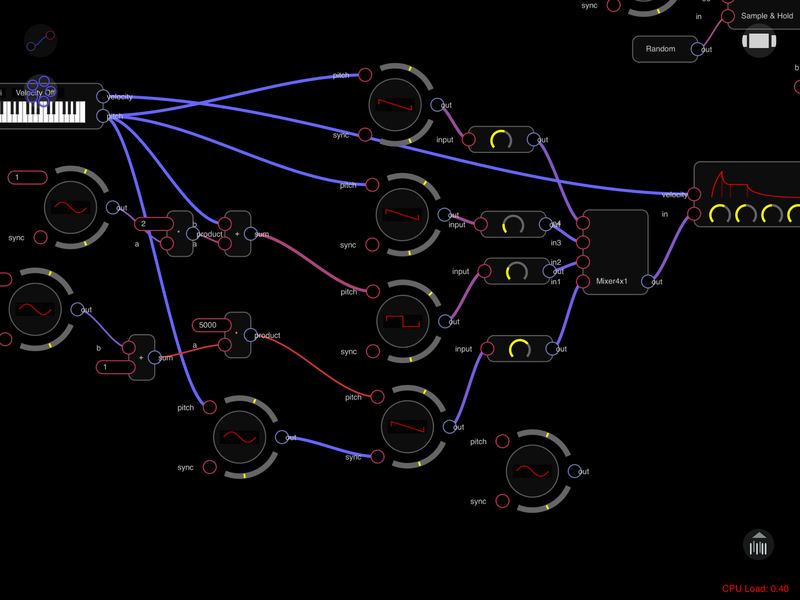 I am happy to report Audulus is a very clean, and extremely capable modular synth. Everything you need (and more on its way) to create your own synth is before you. The U.I. is brilliantly designed with really just two primary buttons viewable on the screen at all times. Located at the top left of the screen are the two buttons. One is an info of sorts, button that identifies things on-screen, and the other is the main menu. The modules, nodes, tools, and all are neatly tucked away out of sight. All those functions are easily accessed by touching the main menu, function button with a second touch elsewhere on the screen. Making connections is as easy as drawing a line that connects the parts. A main circular menu made up of 8 smaller circles contains all the mods and nodes, each with its own sub menu to drill down to further, finer functions. It’s really quite elegant in appearance. Simply select the function you want, and it appears on-screen. It wont take long before you clutter up the screen with virtual wires and modules. Everything responds very well to touch and gesture input, so moving individual parts around is a simple task. Just touch and drag. Creating your own synth from the many available tools is a lot of fun, and very satisfying. You can make pretty much anything you can imagine. Simple sounds to highly complex ones that move, breathe, and evolve can be achieved with a little effort and understanding of how everything interacts, or responds to others. It may be advisable to check out some of the Audulus video tutorials to learn the basics or expand on your existing knowledge. Only a few patches are shipped with Audulus, so checking their forum and looking at the downloadable patches other users are sharing will help get you on your way. Audulus just feels right. Its like painting with sound. 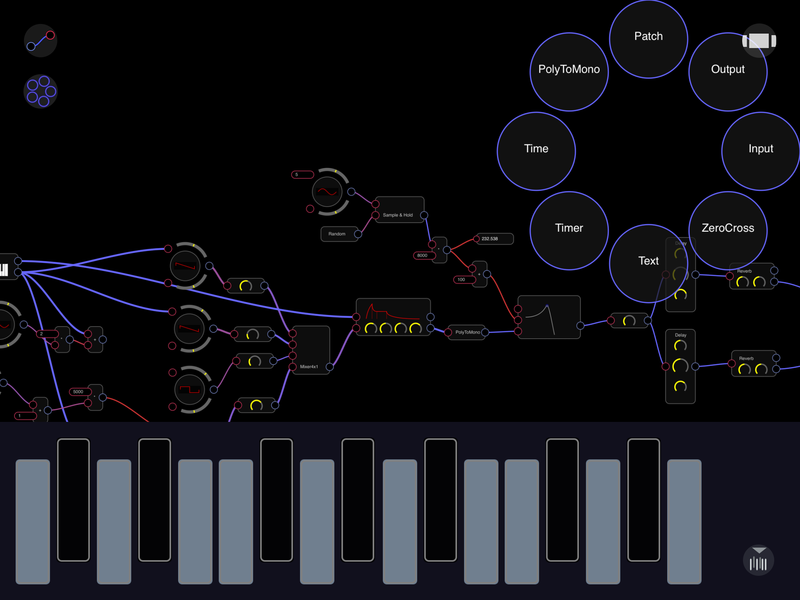 With Audulus you are set forth on a huge world of sound options. Choose one or several oscillators each with its own waveform. Set the routes however you like to obtain the sound you’re going for. Add effects like, delay, reverb, distortion, low pass filter and more. It’s just amazing when you think about how much can be done. It all flows logically. Click HERE to see a brief video of Audulus basics. “Begin a patch on your iPad while on the go. Load it onto your Mac. Even use it inside your DAW. For details, click HERE to visit the Audulus website. I have been quite impressed with the audio quality. Audulus really sounds amazing! The onscreen keyboard is very responsive, and I havent detected any latency at all. Currently Audulus does not record, and you cannot share or move sounds without an internet or computer connection. Record, and AudioCopy/Paste are noticeably missing. That is a bit off-putting. From what I have read (I emailed to confirm but did not get a response) these are features that are a priority to be added. I sincerely hope sooner rather than later. For now we must get along with emailing our patches to each other or ourselves. Not great for those scenarios away from an internet connection, or computer. MIDI users will be pleased to hear that Audulus is fully controllable, and will detect a MIDI connection right away. I’ve had some moments where a touch did not produce the response I was intending, or when trying to draw a connection the module moved instead. It got a little frustrating, but after some time it seemed that a lot depended on how far in or out I was zoomed. I got used to it. Really a minor gripe. Audulus looks and sounds professional. I think most people familiar with modular synthesis will appreciate this most, but really anyone who wants to have A powerful tool to make their own synths from scratch will also find Audulus to be a blessing. This is a sparkling addition to any iOS music app library. I recommend Audulus, but until Record, and AudioCopy/Paste are added, I offer 4 Stars! How did you get on working out the values with the math node’s are all values in the help file, I agree with you a couple of key feature missing but were all assured they will be added. Did you try patches from audulus forum, how did that go, im presuming via itunes sharing? Actually the forum patches can be downloaded directly to the app. 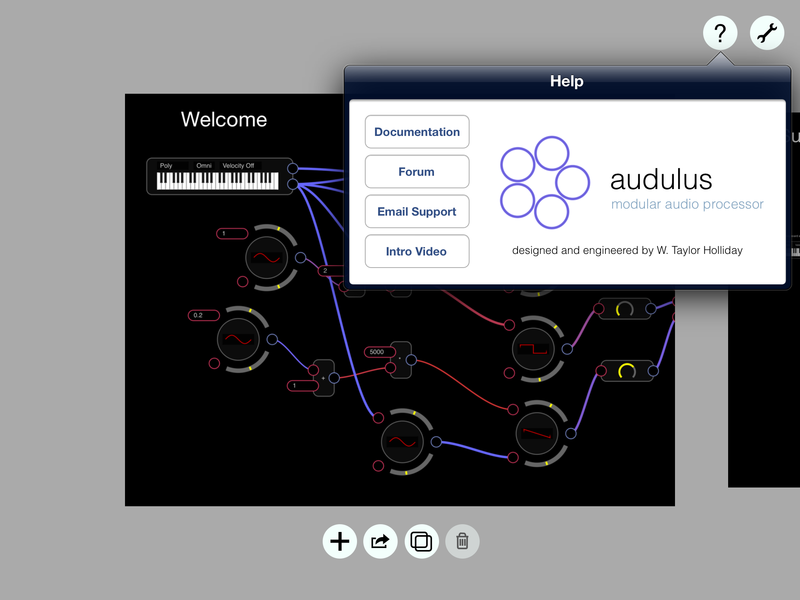 Just visit the forum while on your iPad with Audulus installed, select a patch, then open in Audulus. very handy! I was waiting until I read this review and to see if I was lucky enough to get a promo code before I went and purchased a copy, but now I find that the intro price has gone – so fingers crossed!! Nice review. It really got me interested in working with Adulus.. Sorry about the dreaded WordPress ordeal. Did you manage to test/overload it so it was clipping, my actual question did it take much? Well, it was worth it to wake up in the middle of the night to read this review. Thia app definitely reminds me of Native Instruments Reaktor, where you go snd build synth out of multitude of modules. This definitely seems like a cool app. Ok, good luck to all of us in getting a promo code. This app looks awesome! iOS music production is heating up! Wonderful review, with nice detail and explanation! If you guys have any questions about Audulus, I’m at your service. 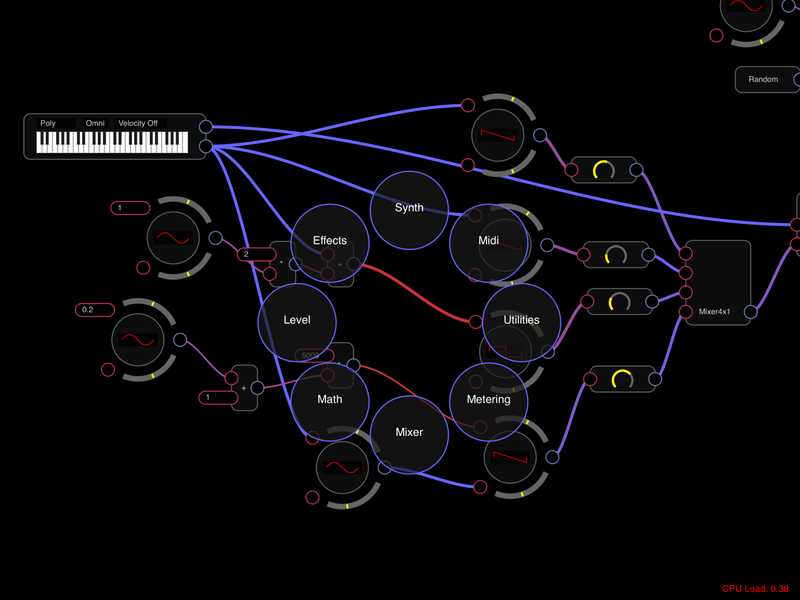 Also, we’ve got a forum going with some experienced users: http://forum.audulus.com and some pretty cool patches. 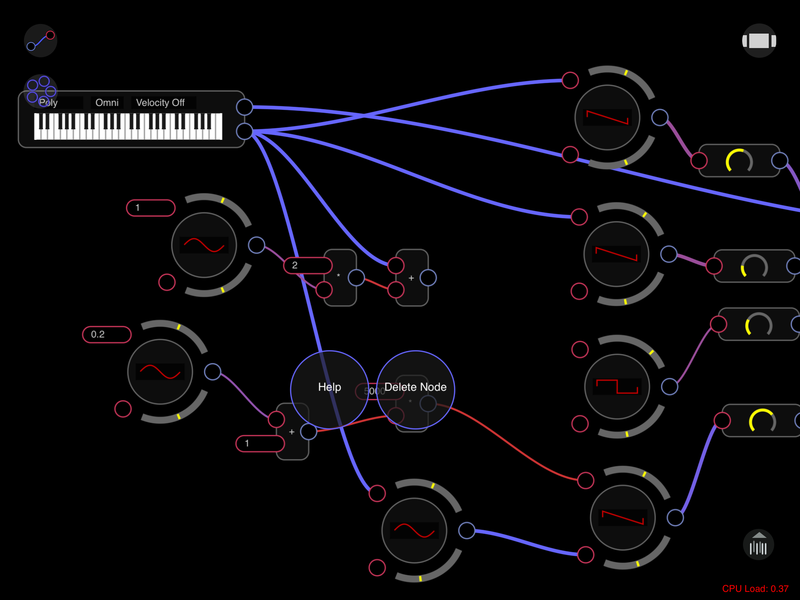 audulus “plays well with others” until we get virtual MIDI. It’s stable through MIDIBridge, and I was able to play my patches without issue through TBMIDIStuff. I was also able to track a Multisynth MIDI-out object from within Sunvox controlling my audulus patch—also through MIDIBridge. Excellent review! Another great DAW/iOS crossover! Another excellent review from Mister SmiteMatter – again it just makes you want to sit down and explore this App. Audulus looks much easier to use than Jasuto Pro! Thanks a million for rewriting the review after losing half of it in cyberspace!! PS my gingers are crissed as well thats ehy there are si many typos at yhe end – that snd the small iphone keyboard!! I sent you a promo code to the email tied to your comment. Enjoy. Another insightful and very helpful review. Reaktor type app comes to iPad! What was the light bulb moment? Audiobus capable? Is Audiobus even out yet? AudioBus support is coming soon to Audulus — I’m going to start working on that as soon as they release. Fantastic. How far off is Record, and AudioCopy/Paste? Assuming Audiobus is a bit further off, those would be extremely useful features. Thanks for doing this review. I’ve worked a little with mod synths but never found any very intuitive. This one sounds like it trumps the others. Can’t wait to give it a run. I’m hoping at some point the patches can be integrated into other apps so you can build your audio in one app, and play it in another. And it has dropped in price and got audibus integrated now! So it’s pretty easy to get sound out of it now.